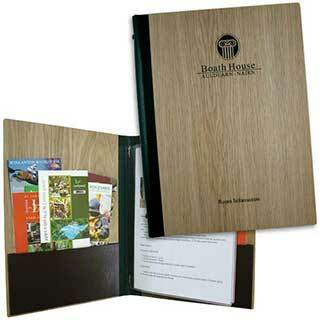 A range of guest room folders in a range of colours, sizes for all establishments. We supply menu and wine list covers made to a restaurant’s exact specification and personalised with their company logo. Tariff boards are a very popular and modern way of presenting menus and wine lists as they can be updated quickly by the hotel or restaurant. Menu and wine list covers, bill presenters, tariff boards and guest room information folders are used by hotels and catering establishments to present their menus and other information professionally. Our menu covers and folders are supplied in a variety of sizes and a full range of designs, fabrics and colours. All our menus and folders can be personalised with a company name and logo. 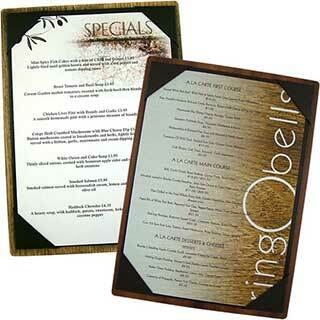 We have a large range of menu covers and folders suitable for all establishments. Guest room information folders are used to present information about the hotel and the venues and attractions in the surrounding area.